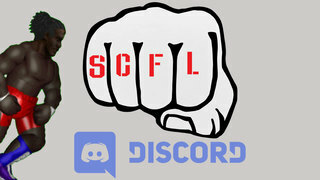 Last week, SCFL provided more than top-notch pro wrestling action. The men of Beliribbuon also took part in kickboxing, and surprisingly, basketball. Don’t fret, though. There was plenty of high-impact wrestling action. The inaugural Daddy-Son Tag Team Dance comprised the bulk of Sunday’s action, and it delivered. Sadly, it maybe over delivered, as it left two men laid out with severe injuries. Federal Bell and Cheesesteak Supreme were both concussed by the eventual winners, the Kelley family. Bell was taken out in the semi-finals by Mickey, while Kelly won the tournament by kicking Cheesesteak unconscious. It was a spectacular turn of events for Bell, who just 24 hours prior defeated Discussion Davis via decision in a kickboxing match. In other kickboxing action, the Sons of Anger shined, as all three Trios champs won by knockout. Rastaban Baptiste took out the severely over matched Let Liu in the third round. Ratt Middle also took the final frame to put away Especially Esposito. Meanwhile, Gorvis Rogers knocked out Brick Roberts in the first minute of the first round. On the basketball court, the Sons of Anger took on a bizarre hodge podge team, consisting of the Missouris, the Kelleys, and both Lil and Fat Jonesy, among others. The game had long stretches of bad basketball, featuring a lot of unnecessary passing and poor shot selection, but it also saw several outstanding alley-oops and some clutch three point shots. To see these clips live, don’t forget to follow SCFL at twitch.tv/scflpro to be alerted when the broadcasts begin.